Sufferers can be chronically tired, bedridden much of the time and suffer pain that feels like body-wide bruising. It can hurt even to be touched by another person. Restful sleep is difficult. Many people who have fibromyalgia also have tension headaches, temporomandibular joint (TMJ) disorders, irritable bowel syndrome, anxiety and depression. Fibromyalgia is not well understood at all. It can develop gradually, or have a sudden onset triggered by a traumatic event like a car accident. Its cause is not known. The best current explanation of what happens is that somehow the sufferer’s brain simply becomes more sensitive to pain (“central augmentation of pain sensitivity”), but how or why that happens is more or less anyone’s guess. There’s no cure, or even real treatment. For symptom relief, sufferers may be prescribed a cocktail of some combination of diazepam, naproxen, ibuprofen gel, tramadol and Fentanyl patches, but like most pain meds, these yield diminishing benefits with habituation, and escalating doses can be dangerous. Anti-depressants are sometimes also prescribed to help the sufferer deal with the overwhelming stress of the disease. A few years ago, anecdote began to circulate from people with fibromyalgia, that float tanks provided remarkable relief for them. Tina Graham, for instance, was recorded in an interview saying, “After that first float I had complete pain relief for about 17 hours,” and discussing how much her subsequent sessions improved her life. In 2011 Borrie, Tamara Russell, and colleagues started the Fibromyalgia Flotation Project, with no money, all volunteer, to try to test this treatment on as scientific a basis as possible. Is there an immediate effect from the float sessions, and if so, does it last? 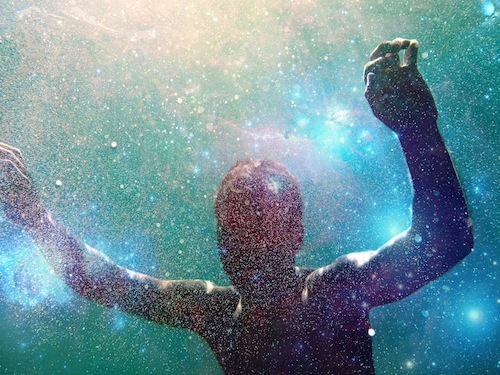 They sought volunteer subjects with fibromyalgia, and float centers willing to contribute free time in their tanks. Each volunteer took three hour-long float sessions over three weeks, and answered a questionnaire before and after each session about ten variables. When they discussed intermediate results at the 2012 Float Conference, they had had 81 participants across five countries (US, UK, SWE, GER, NL). The results were astonishingly positive: “Without exception, the immediate intervention effects (average pre-post change) are highly significant for all variables in the expected direction (e.g., pain ratings decrease on average by 2.3 points on an 11 point scale from pre- to post-intervention).” There was no control group in the first phase, but in context, fibromyalgia is known as a disease with no good treatment. The six bars shown here are average levels of discomfort reported before and after three flotation sessions. There are two important results here: first, there is a highly significant improvement across each float session (1→2, 3→4, 5→6), with p < 0.01%, and this improvement is of quite large magnitude. Also, and perhaps even more importantly, there is a progressive improvement from session to session with only one session per week (1→3, 3→5), also with p < 0.01% significance. This seems particularly noteworthy in contrast to pain medications, where habituation typically leads to reduced effect. Similar results were seen for pain, muscle tension, ease of movement, feelings of stress, sadness, well-being, relaxation, and sleep. The effects on energy were not as dramatic, but generally neutral-to-positive. 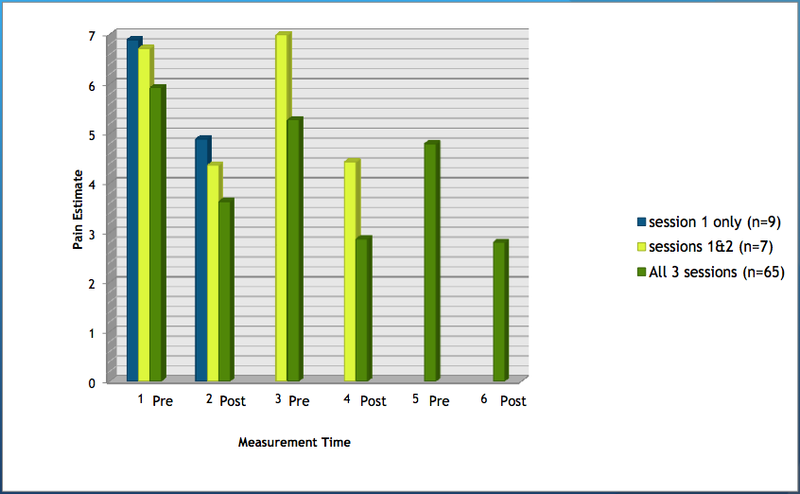 Here the blue lines show the pain levels reported by participants who only attended one session; yellow, two sessions; and green, all three. 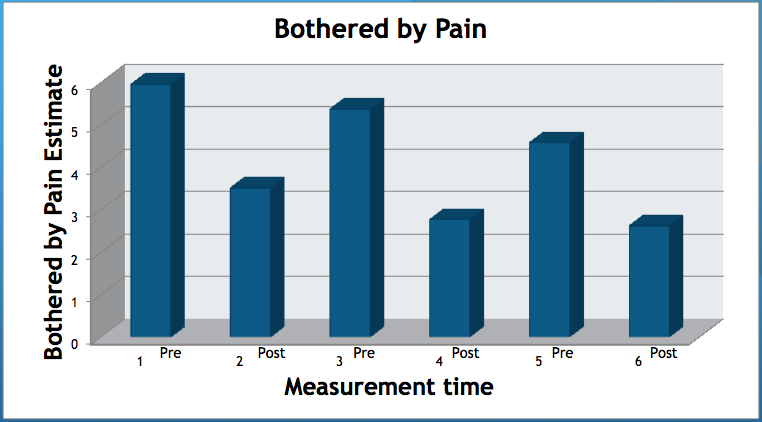 We can see that the dropouts reported greater pain at every point, but importantly, with respect to their own baselines, they still experienced improvement. So it appears that whatever their reason for dropping out was, it wasn’t because floating gave them no benefit. The Fibromyalgia Flotation Project is continuing into a second phase to follow up on these very promising results, still with no funding. They’re trying to push both for greater numbers of participants, to better persuade the medical establishment, and also for a longer test period (ten weeks instead of three) to see how sustainable the results are. It’s all being organized via the internet; sign-up is at fibromyalgiaflotationproject.com. We at float are pretty enthusiastic about this plan, and look forward to getting involved once we open our doors. If you have fibro, or know someone who does, sign up for our mailing list and we’ll keep you informed.